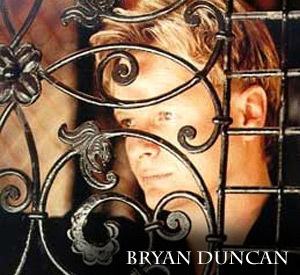 Bryan Duncan (born on March 16, 1953 in Riverside, California), is a Dove Award- and Grammy Award-winning American Christian musician who started his career in 1973 with the Jesus music band Sweet Comfort Band. The band went their separate ways in 1984 having made the successful transition to Contemporary Christian music. 1985 marked the beginning of his solo career. Bryan has sold in excess of 1 million records, released 15 solo albums, and appeared on several compilation projects. He has released three solo video projects and one joint tour video as well as having done the video for the smash hit, Left Behind: The Movie. Bryan has been the recipient of three Dove Awards and has received multiple Dove Award nominations. Bryan has had many #1 hits over the years including “Traces of Heaven,” “Things are Gonna Change,” “United We Stand” and “Don't Look Away” from the Slow Revival album; “Love Takes Time,” “You Don't Leave Me Lonely,” “Into My Heart,” “When It Comes to Love” and “I'll Not Forget You” from the Mercy album; and “A Heart Like Mine” from the compilation My Utmost for His Highest. Most recently, Bryan has started his own record label called Red Road Records, short for Redemption Road Records. He has started a new band called the Nehosoul Band with musicians Ricky B (bass player), composer and keyboardist Phil Curry, lead guitarist Walter Finch, and drummer Sam Matthews. The Nehosoul Band produced Music City Live in 2004, “A Nehosoul Christmas” in 2005, and “Still Dancin’” in 2008. This is a little humor book full of “Snout lists”... similar to top ten reads. it’s Six chapters of motorcycle humor, with a little personal preface in front of each about my experiences. 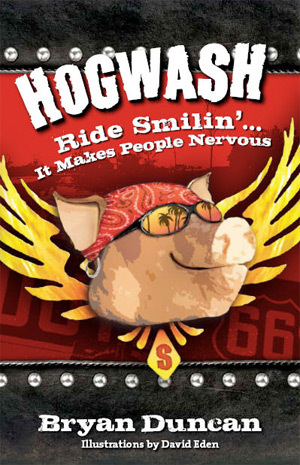 You can order it at www.hogwashhumor.com. Titles include: How a Biker Knows He’s Gettin Old, Stuff you won’t find at the harley dealer, How you know yer at a biker wedding, things you donâ€™t get with that HOG membership card, and How a biker knows there’s been a down turn in the economy. Snoutly Rudescooter is my alter ego and the flying pig on the cover! Dear God Really? 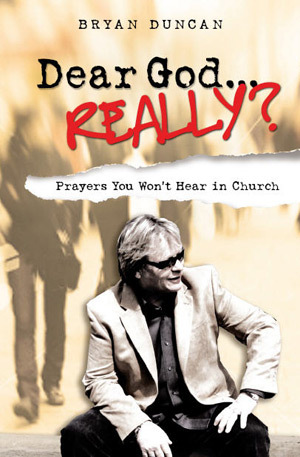 It’s a humorous take on ill informed over emotional prayers that only God could tolerate! Already a big hit with those who’ve heard my readings at concerts. Titles include: Dear God... I’ll be right back, Dear God... Can I Get Extra Credit?, Dear God... I Don’t Like Some Of Your Friends, and Dear God... I Suggest We Do Away With Mondays. It will be available at www.deargodreally.com. To book Bryan Duncan, please contact Lisa Darden at lisa@huptalentandbooking.com or call 240-446-1554.